David Lynch, a best-director nominee for "Mulholland Drive," at the compound where he lives and works in the Hollywood Hills. Naomi Watts, left, and Laura Elena Harring as Hollywood roommates in "Mulholland Drive." 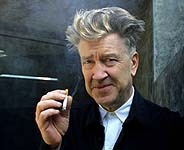 LOS ANGELES -- WHEN you think about it," David Lynch says, "nothing makes sense in awards." True enough. For the second time, the Motion Picture Academy has nominated Mr. Lynch for best director for a movie that it did not see fit to nominate as best picture. It happened in 1986 with "Blue Velvet," and it's happened again this year with "Mulholland Drive." In each case, it was the film's lone nomination. This year's honor seems especially weird, for several reasons: Mr. Lynch wasn't nominated by the Directors Guild of America, whose choices usually predict those of the academy; and in both the New York Film Critics Circle and the National Society of Film Critics, "Mulholland Drive" was voted best film, but Mr. Lynch lost out to Robert Altman as best director. "So I didn't expect anything," says Mr. Lynch, puffing contentedly on an American Spirit cigarette and swigging good, strong coffee from a mug approximately the size of a beer stein. "Sometimes there's no kind of rational explanation for why things go badly, and the same applies for when things go good." (He was also nominated in 1981 for his direction of "The Elephant Man," which received eight Oscar nods, including best picture, and — go figure — zero statuettes.) As far as he's concerned, his Oscar nomination "doesn't have to make sense, because it makes another kind of sense: you can intuit it, sort of." He doesn't elaborate, preferring to let the paradox hover in the air for a few seconds, like a smoke ring. To summarize: it doesn't make sense, but it makes sense. I find myself nodding in agreement, intuiting something: This isn't just David Lynch's take on the Oscars — it's his worldview in a nutshell. The weather is gorgeous in Los Angeles this late February morning, sunny and clear and unseasonably warm (the temperature will climb into the 80's in the afternoon), and Mr. Lynch, from the compound where he lives and works in the Hollywood Hills, has a sensational vantage point on the unfolding day. He has lived in L.A. since 1970, when a grant from the American Film Institute lured him away from art school in Philadelphia; he's as enthusiastic about the place as a Chamber of Commerce booster. "It took me a long time to get a setup like this," he says, referring to his hillside creative complex, which also includes a lavishly appointed recording and editing studio. "That's one of the things I used to long for, a setup where if you catch an idea you have the means to realize it. There's a lot of frustration when you don't have that; it can be a torment. The idea may not go away, but it's not going to have the heat it had when you first got it. So it's good to have a shop of some kind." Looking at David Lynch in this setting, and listening to his rapid, digressive, almost alarmingly animated discourse, I realize that he has, to a greater degree than anyone I've ever met, organized his life to facilitate the collection and processing of artistic ideas. In fact, he speaks of ideas as if they were things entirely outside him, buzzing in the air like the insects he uses as part of the texture of his paintings. He speaks of them the way a devout Christian speaks of grace. When, for example, he tries to explain the process of making "Mulholland Drive," his whole breathless account of transforming a television pilot (summarily rejected by ABC) into a feature film hinges on the agonizing suspense of waiting for ideas. "A pilot is almost the opposite of a feature film," Mr. Lynch says. "In a pilot you're setting things up, everything's open- ended. You're just feeling the pull into a world, and maybe instigating the desire to go further." But when the French studio Canal Plus obtained the rights to the failed pilot, "I started panicking, because I didn't have the ideas to finish it." The cavalry, however, arrived in the nick of time. He says: "One night, I sat down around 6:30 and closed my eyes, and in came, over the next half-hour, all these ideas. And by 7 o'clock I was a happy camper. The new ideas married with what had gone before, but they changed the angle of seeing it: they affected the beginning, the middle and the end. "I felt so lucky and blessed that those things came in. It was kind of unbelievable. I wasn't even thinking about `Mulholland Drive,' then — bango! — the door opened and there they were." That, I guess, is how Mr. Lynch's hillside compound is designed to work: if you're set up right, you're always home when epiphanies come calling. "It doesn't matter how a thing starts off," Mr. Lynch says; "what matters is paying attention to where the ideas are leading you. Because when you think you're leading them, that's when you get into trouble." As if to demonstrate the truth of this observation, our conversation, which started off as a discussion of the March 24 Academy Awards (he says he knows his chances are slim but plans to attend the ceremony, at the Kodak Theater, because "the new building is right down the street, and I haven't ever been in there"), winds up taking its own wayward path to a place where, apparently, it was always determined to go. It's as stubborn, in its way, as Alvin Straight, the lawn-mower-riding pilgrim of Mr. Lynch's great 1999 road movie, "The Straight Story." As we follow this twisty route, we talk about actors (for whom Mr. Lynch's highest praise is that he or she has "got the stuff"); about the composer Angelo Badalamenti, who has scored all his film and television work since "Blue Velvet" ("He's a terrible person, really, because he's so lazy, and he should be writing music every single day"); about his childhood television watching (his favorite shows were "Perry Mason" and "The Honeymooners" — mostly because of its theme song); about his early experiments in filmmaking, when, as an art student, he decided he needed to create a "moving painting"; and about his recent explorations of the Internet. Although he's upbeat and ebullient about everything, the subject of the Internet really seems to light his fire. He has spent recent months working on his Web site, davidlynch.com, which was launched a couple of months ago and, he says, "got three million hits the first day, which fried our system." The site will eventually accommodate original live-action drama, but for now the only series Mr. Lynch has managed to get going is the animated "Dumbland," which he describes as "a stupid, absurd — you know, bad — cartoon." He waxes lyrical for a while about the computer technique of flash animation ("It's incredible!") and Photoshop graphics software ("It's pure magic! "), and, finally, the Internet itself. "It's an open door to the ether," he gushes, "which is infinite. And with the new technology, you can make things just the way you want them to be. I'm pumped up. I still love to paint, I love organic things, I love sawing wood, but now these other tools are here, too. They won't take the place of painting. And film — there's something unique that that emulsion does. There's plenty of room for all kinds of things." I'd been warned that Mr. Lynch is prone to verbal tangents, but his passionate spiel on the joys of cyberspace doesn't last quite long enough to be truly worrisome, and, besides, it somehow feels (as he himself might say) organic. Because our conversation, no matter where it started or where it wanders, always seems to be circling around a single theme, which is, to put it kind of crudely, the nature of the creative process. For Mr. Lynch, it's all about opening those doors, catching those ideas and solving mysteries — in a very particular way. "Mysteries are my No. 1, you know, thing," he says. This is not news to the viewers whom he has, over the years, plunged into the enigmas of "Eraserhead," (1977); "Blue Velvet"; the "Twin Peaks" television pilot and its startling movie prequel "Twin Peaks: Fire Walk With Me" (1992); "Lost Highway" (1997), and "Mulholland Drive." But solving those mysteries is, he says, "a tricky business." With "Mulholland Drive," for instance, "I didn't want to know too much about how the story would turn out. If I knew everything, I'd start getting bored. When you live with a solution for too long — well, it's a mess." The only kind of solution he likes is one he can discover in the process of making the film: "You have to solve the mystery and still leave room to dream." That's an exact description of the effect of David Lynch's cosmic detective stories, which tend to start out at the scene of a crime and end up in a place that's neither here nor there — or, I guess you could say, a place where inside and outside are pretty much the same thing. This is the world that Mr. Lynch has set himself up to live and work in, and although audiences often claim to find it baffling, he genuinely believes that we all know this terrain better than we think we do. "Intuition is alive and well in people," he says excitedly. "You use it all the time in daily life, and that means you get an inner knowing, which isn't always able to be expressed in words. I'm convinced — maybe because I want to be — that people do have that inner knowing when they see abstractions in film. And they should trust that feeling. With intuition, it's the detective in us that comes alive." The detective in me remains, even now, a little puzzled by my brief, cheerful, oddly intense encounter with David Lynch. When I think about it, nothing — not the occasion, not the setting, not the serpentine path of the conversation and certainly not the "solutions" we arrived at — seems to make sense. But it makes sense. Terrence Rafferty is critic at large for GQ magazine.